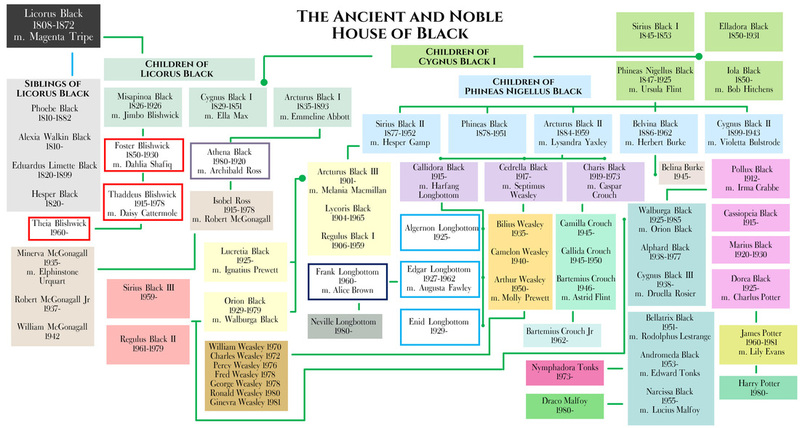 Since the majority of the "canon" Black Family Tree was taken from Order of the Phoenix off of the Black Family Tapestry, a lot of relationships are assumed but not confirmed by JKR, such as Licoris and his siblings: Phoebe, Alexia Walkin, Eduardus, and Hesper. When writing the family tree (which took over 8 hours of just putting it all together cohesively) I mixed up Marius and Dorea's birth years (Dorea was born in 1920, not 1925). Without noticing, I kept writing. I'm keeping it this way for story purposes, because the five year difference actually helped with a few things, and it ultimately does not take away from anything. Misapinoa Black Blishwick (according to the tapestry) was not known to have any children. However, I wanted a younger generation of Black related witches, so I created Misapinoa's great-grandaughter, Theia Blishwick. Arcturus Black I (according to the tapestry) never married, nor did he have any children. Because I wanted Minerva connected to the Black Family, I made her a descendant of Arcturus I through her mother, Isobel Ross. Lucretia Black Prewett (as pointed out to me by the awesome KittenShift17) was once thought to be Molly, Fabian, and Gideon's mother, as Sirius tells Harry that Molly is his cousin. However (likely because this would make Molly and Arthur cousins) JKR said that Lucretia was married to Ignatius Prewett, Molly's uncle. This is the theory I go with for RoBM. Enid and "Algie" Longbottom. Other than saying that they are Neville's great-aunt and great-uncle, Enid and Algie are never given surnames. Because of this, I've decided to add them as Callidora's children, along with "Edgar" who I named as Frank Longbottom's father. Likewise, Augusta Longbottom is never given a maiden name in canon, so I have made her a Fawley. Arthur Weasley is known to have two brothers. It is assumed that Bilius is one (but never confirmed) there is another Weasley brother who is never named. In going with the Arthurian theme for names, I named Arthur's second brother Camelon. While it's not here on the family tree, More-to-it-than-blood pointed out that the Weasleys squib cousin was likely Camelon's child. We decided that it is totally canon that his name is Merlin (which he later changed to Marlin). Charis Black and her husband Caspar Crouch had two daughters and one son. I created Camilla to be one of those daughters (the other having died). Since we were never told Bartemius Crouch Sr's parentage, I assumed that Charis Black was his mother. Also, we were never told Barty Crouch Sr's wife's name, so I named her Astrid Flint. Belvina Black Burke was thought to have two sons and one daughter, though none are given names. I have not included the two sons (because (a) I didn't know about them until researching just now, LOL, and (b) there is no more space on this damned family tree. I used her canon daughter to create Belina Burke. Some characters that did not have specific death dates on the Black Family Tapestry (but did not serve a purpose in this story) have had death dates added to their names. Araminta Meliflua Black is canonically known to be Walburga's cousin, which would make her the daughter of either Marius or Cassiopeia Black. Since Marius is a known Squib, it's likely that (in canon) Araminta is Cassie's daughter. Since I did not want Cassie to have children in this fic, I omitted Araminta's relationship to her (and she is not on the family tree because of that). How is Everyone Related Now?